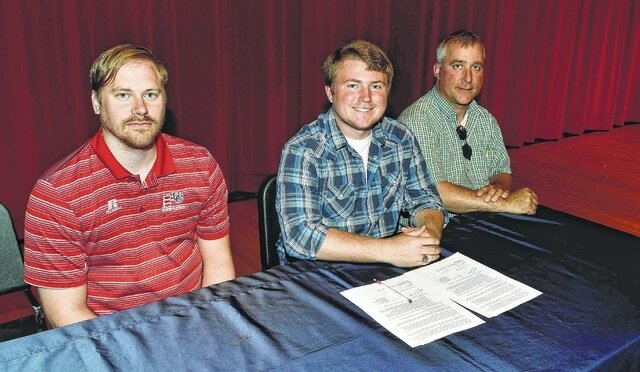 Pictured with Conner Leidtke, seated center, at his signing to attend the University of the Cumberlands are, from left, Patriots’ bowling coach Kevin Rigle, left, and his father, Morgan Leidtke, right. At Big Walnut, Leidtke participated in baseball and bowling for the Golden Eagles. He earned a varsity letter as member of the BWHS boys bowling squad. Conner, who will major in pre-med, chose the University of the Cumberlands because it has a great med program, a good bowling program and a beautiful campus. Leidtke’s favorite Big Walnut memory? Reaching the Districts in bowling his senior year.